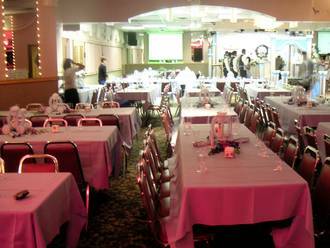 Welcome to Starlite Pavilion, located in the Richmond Hill section of Queens, New York City. Starlite Pavilion is one of the most luxurious halls where you can host that very special event in complete confidence. The service you'll receive at Starlite Pavilion is first-class from the beginning of your event to it's completion. All event requirements will be completely handled by a professional events manager who will provde all the resources to meet your utmost needs and desires to make your occasion the best it can be! 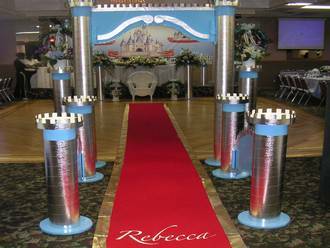 Weddings are a life-event and we want your wedding to be a unique and memorable occasion. Everything must be just right for the bride and groom and all your guests. We can tailor your requirements so that nothing is left to chance. A wonderful event and a wonderful experience await you and your guests at Starlite Pavilion! Birthdays are fun occasions that you'll want to enjoy with family and friends. Starlite Pavilion is the perfect place to have your birthday party. Our spacious accomodations will easily hold all your friends and family. We have an outstanding dance area where you and your geusts can dance through the night. Our DJ Sound System is perfect for your party music and special requests! Sweet Sixteens parties are great for that young gal just reaching maturity. 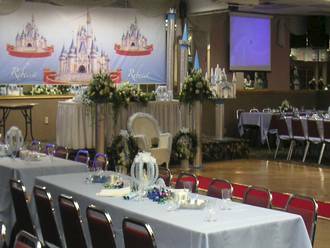 Starlite Pavilion can host your Sweet Sixteen party with ease for your special guest of honor and her friends. It will be an unforgettable occasion with fun for all! Anniversaries are very special. They represent milestones in a long and happy relationship and continued joy into the future. Whether your anniversary is the first, yearly, 25th or 50th, don't pass up the opportunity to let Starlite Pavilion be the place where this happy occasion takes place! Holidays are a joyful time when you can enjoy the company of friends and relatives. There's no better time to get together and enjoy the holiday spirit. Starlite Pavilion excels at providing a festive atmosphere where your special holiday get together will be a memorable one! Thanks to Starlite's ample space and seating capacity it's the ideal place to hold a concert for your favorite group, large or small! 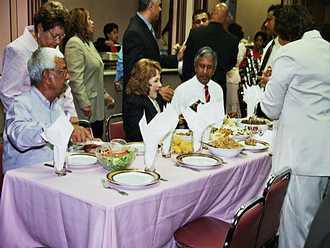 Starlite Pavilion is a great place to hold your business seminar or corporate meetings. Lighting, seating, and sound system are just some of the special amenities that are available. Your business seminar or meeting wlll be both memorable and enjoyable at Starlite Pavilion! The Starlite Pavilion boasts a seating capacity of 350 persons, 418 persons standing - ample capacity for just about any occasion! A non-alchoholic juice bar is available for serving refreshments and complete food catering if desired, is available for you and your guests! 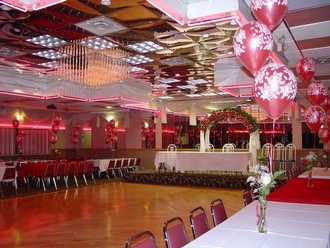 Starlite Pavilion has a fabulous and large dance floor where you and your guests can dance the night through! The floor plan at the right shows just one possible arrangement for your event. We can adjust accomodations to suite your requirements. Starlite Pavilion's lighting system can accomodate almost any kind of lighting requirements for your occasion from general flood lights to focused spot lights. 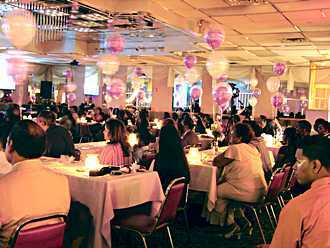 We can create the right lighting to enhance your event. Satrlite Pavilion has a full-featured sound system with complete audio mixing facilities in-house. This allows us to provide first-class sound for both live artists and prerecorded material! We'd be happy to provide tours of our facilities so you can see for yourself what we have to offer. Custom package details and price quotes are available by appointments only (sorry, no telephone quotes). 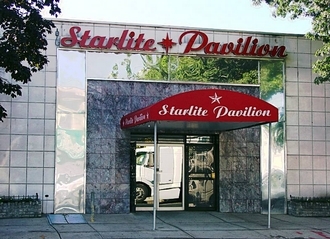 Starlite Pavilion is easily accessible from all five boroughs of New York City. Click on Directions on the menu above for complete travel instructions. 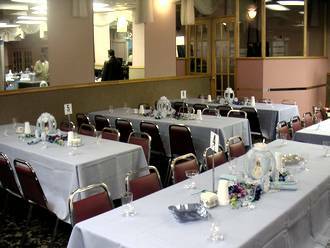 Booking your event at Starlite is easy: Just give us a call at 718-850-1300 so that we can fully discuss your individual requirements with you. If you have additional questions please click on Questions? in the above menu. Thank you for visiting, and we look forward to creating that very special event for you and your guests!! !